New Delhi, 25thSeptember 2014: Being a diva at work requires you to be creaseless – at work, with your clothes, hair or even your makeup. Yet the biggest struggle that the 9to5 woman has with her office makeup is that of her lipstick drying and settling into the creases of her lips. Keeping this in mind, Lakmé 9to5, your favorite office stylist makeup range is back with its latest product addition - Crease-LessTM Crème Lipstick, a revolutionary new crème lipstick that hides lines in just one stroke, saying goodbye to the lines on your lips. 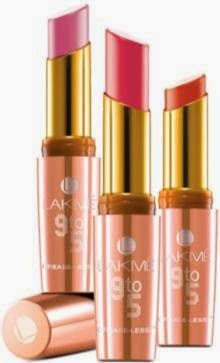 This new launch from Lakmé is a line of innovative long wear lipstick which comes in an ultra-creamy texture and delivers a high colour pay-off and stays on through the day from 9to5. The Crease-LessTM Crème Lipstick also contains vitamin E, shea butter, cocoa butter & olive oil for intense moisturization leaving your lips hydrated all day, making it the must-have accessory in your bag especially for dry winters up ahead. This product comes with a pallet of pinks, deep reds, mauves and browns that are most apt for daily wear, perfectly complementing your office wardrobe. This high performance range doesn’t requiretouch-ups through the day, thus, providing a hassle-free transition from the desk to the office party. So make sure you grab your personal office stylist Crease-LessTM Crème Lipstick and reinvent yourself into the work-place diva that makes all heads turn! Vow.. crease wud free wud def be good.. will chk out the shade at a counter! !